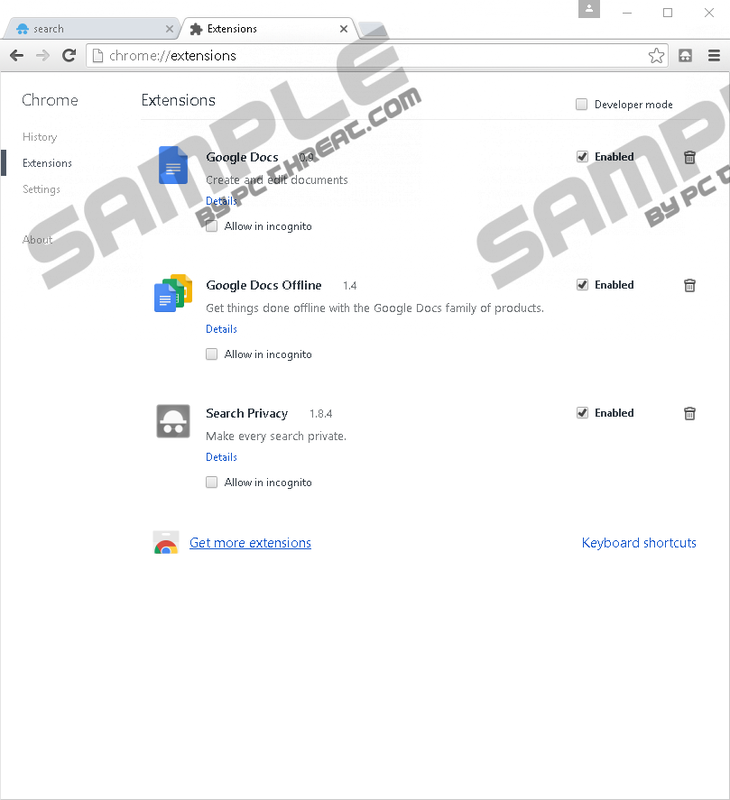 If you have an extension called Search Privacy on your Google Chrome browser, then we want to inform you that you have an adware-type program on your PC and that you have to remove it to keep your PC out of harm’s way. Truth be told, this application comes from a shady background, and you should not trust it with providing you with reliable search results because it comes with a search engine called Searchprivacy.co that is set to replace your web browser’s search provider. Also, this program and its search engine can collect information about you and your browsing preferences to tailor the commercial advertisements that it is bound to inject into the search results as well as other websites. To find out more about this program we invite you to read this whole article. While gathering information about this adware, we found that it is distributed using two channels. The first channel is the Chrome Web Store from which anyone can download it as it is freely available to all Chrome users. It is rather odd to see this application on this website because Search Privacy is not a very reliable extension. Nevertheless, it should be removed from there at some point. In any case, the other distribution channel is shadier as it involves bundling this adware with third-party applications and putting it up for download on questionable freeware sharing websites. In this instance, this adware might enter your computer secretly. So be sure always to opt for advanced installation settings when installing a program from a freeware hosting website because you will end up installing applications such as this one. Most adware-type software is made as a browser extension and is set to render advertisements in the form of coupons, banners, pop-ups, in-texts, interstitials, and so on. However, this particular application goes further and features an accompanying search engine that has been configured to display promotional links in the search results. Note that this search engine is set to replace the search provider only, so your homepage stays the same. Only when you enter a search query in the address box will Searchprivacy.co process it and display search results. We have found that the advertisements are presented as simple links. There are no flashing visual ads urging you to click now to get the deal of the century. No, everything is subtle as it should be in order not to give away the true intentions of this search engine. The modified promotional links are presented on the right side of the search results window and at the bottom of the page. Note that those ads are injected by the search engine Searchprivacy.co. However, Search Privacy is also set to display advertisements, and its ads may come as pop-ups, coupons, and so on. Regardless of whether the ads come from the search engine or the browser extension, all of them are unreliable, and you have to take that into consideration. We think that such an unreliable program may promote malicious software and scam and phishing websites, so you must prevent that content from reaching you by uninstalling this adware. Before we wrap up, we want to touch upon Searchprivacy.co’s and Search Privacy’s information collection practices. We have found that both of them are set to collect information about you that includes your IP address, search history, ads clicked, as well as user agent and user preferences. The developers say that this information is used to provide better custom advertisements, so this spying is of no use to you, and you should delete this application. In closing, there is not a shadow of a doubt that Search Privacy is an undesirable and even dangerous application because there is no way to tell whether its promoted content is safe to access. It does not protect your personal privacy like its promotional slogan claims, so there is no reason to keep it on your PC any longer. Please follow this simple removal guide if you want to get rid of it. Press Alt+F and open More tools. Quick & tested solution for Search Privacy removal.